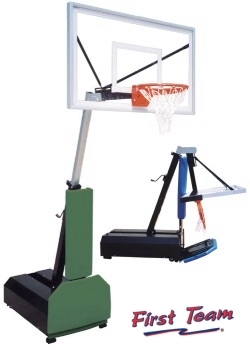 The Fury portable basketball goal is designed to withstand the demands of adult recreation centers while providing the flexibility necessary for many churches and elementary grade levels. The Fury is infinitely adjustable. Simply turn the adjustment crank handle behind the unit to lower the rim height anywhere from 10' down to 6'6". The Fury's exclusive crank adjustment design is vastly superior in overall rigidity compared to similar goals using inferior "spring-slide" methods. The Fury is engineered to be extremely easy to move. One person can transport the goal by flipping the lower pad forward and rolling into position. Return pad to upright position to lock base in place for play. The extension arm can be dropped without tools to allow the Fury to pass under doorways. The backboard to base extension is 48" with the rim at regular height. This allows the Fury to sit "off-court" for player safety. Heavy padding, available in several colors, protects the player from contact with the base unit. BALLAST NOT INCLUDED: This system requires a recommended 540 lbs of ballast. Recommend solid concrete blocks from local home improvement center. 4"x8"x16", 2"x6"x14" blocks or like. (LL) Call or submit this form for IMMEDIATE pricing.